Queen organic anti aging and regenerating face cream quenches the thirst of the most dry skin while its synergistic blend of highly active natural agents produces a remarkable regenerating and anti-aging action. Nilotica Shea Butter and Mafura Butter deeply nourish and moisturize. Prebiotics encourage the growth of probiotics, the good bacteria, referred to as “the imminent revolution in skincare”, which make the skin less hospitable for harmful bacteria that cause skin disorders, acne and eczema and premature aging. Tamanu oil, the "Green Gold in skin healing and cell rejuvenation", has remarkable regenerating, anti-aging, anti-inflammatory, anti microbial and anti-oxidant properties. Argan oil has a unique blend of natural, rare and essential components which make it one of the most potent anti-aging, anti-oxidant and anti-inflammatory skin agent. By promoting collagen synthesis, Pomegranate seed oil, improves skin elasticity and strengthens the epidermis. Macadamia oil is the best choice for people with mature and dry skin due to the high content of palmitic acid which is vital to reduce the skin's aging process. To this we have added natural antioxidant Vitamin E, Jojoba oil for its protective, moisturizing and anti-inflammatory action and avocado oil for its wonderful emollient, nutritive and healing properties that make it ideal for mature skins as well as helping to relieve the dryness and itching of psoriasis, eczema and other skin ailments. Naturally scented with Palmarosa and Sweet Orange essential oils, our Queen organic face cream smells divine. SKIN TYPES: Especially formulated for dry, mature & demanding skin, skin affected by excessive sun exposure. 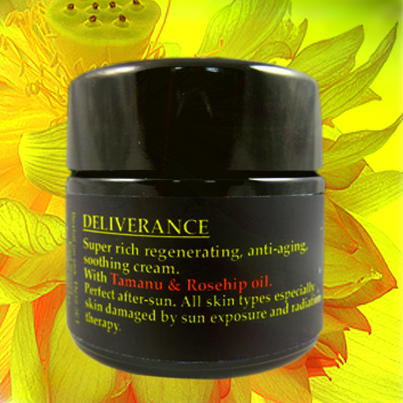 Suitable for all skin types especially for sensitive skin and skin prone to eczema, psoriasis, dermatitis & rosacea. Queen organic face cream can also helps to reduce pigmentation, marks and scars and is also suitable for skin affected by chemotherapy and radiotherapy. USE: Massage into clean, dry skin on face and neck. Use daily in the mornings and evenings and whenever your skin needs a moisture top-up. INGREDIENTS: Spring water (aqua), Rose (Rosa damascena) water*, Nilotica Shea butter (Vitellaria nilotica Fruit Butter)*, Mafura Butter (Trichilia Emetica Seed Butter)*, Plant wax extract (Cetearyl Olivate, Sorbitan Olivate), Argan Oil (Argania Spinosa)*, Tamanu oil (Calophyllum inophyllum)*, Jojoba oil (Simmondsia chinensis) *, Evening primrose oil (Oenothera Biennis)*, Macadamia oil (Macadamia Ternifolia)*, Pomegranate Seed oil (Punica granatum linn), Avocado oil (Persea Gratissima)*, Prebiotic (Inulin, Alpha-glucan oligosaccharide), Vitamin E oil (Tocopherol), Rosemary (Rosmarinus Officinalis) extract, Palmarosa essential oil (Cymbopogon Martini), Sweet Orange essential oil (Citrus Sinensis)*, Xanthan Gum (Natural Thickner), Vegetable -based fragrance (Fragrance)**, Citral**, Geraniol** Farnesol**, Limonene**,Linalool**. 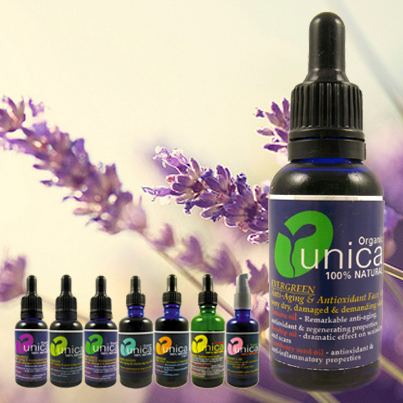 *Certified Organic by Soil Association **from essential oils. UNICA feeds your good bacteria – not just your skin – by using Prebiotics. Prebiotics encourage the growth of probiotics, the good bacteria, referred to as “the imminent revolution in skincare”, which make the skin less hospitable for harmful bacteria that cause skin disorders, acne and eczema. Two studies that have demonstrated that prebiotic and probiotic products actually influence the appearance of the skin. One was published in the British Journal of Dermatology and showed that eczema improved when patients were treated with a prebiotic cream, and the other appeared in the Journal of Dermatological Science and demonstrated that the levels of bacteria causing acne could be lowered with prebiotics without influencing the levels of the good bacteria. Prebiotics also play an essential role in keeping the skin young. When the balance of microflora is damaged, the skin becomes irritated. The body responds to this irritation by creating free radicals, which play a primary role in premature aging of the skin, and a collagen-digesting enzyme. Because collagen is essential to young-looking skin, the last thing you want is to destroy it. 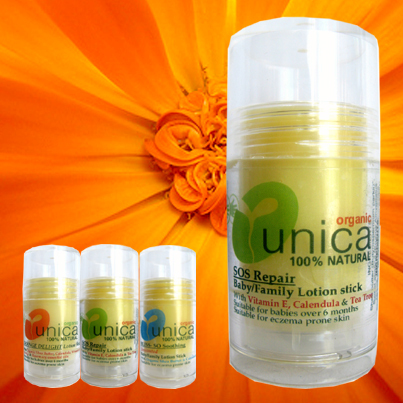 Unica uses a natural prebiotic for the skin, derived partly from one of the constituents of the chicory root, namely inulin, and partly from the natural sugars that result from an enzymatic process. Mafura Butter is obtained by boiling the seeds of the Trichilia emetica tree, which is native to southern Africa, in water and soaking them for several hours. The seeds are then crushed and the oil, which forms a solid butter at room temperature, is extracted. Mafura Butter melts at 30˚C and is rich in essential fatty acids (palmitic, stearic, oleic and linoleic), which aid retention of moisture levels in the skin, helping soften and soothe the skin, and promote cellular regeneration. It has also been shown to be a potent free radical scavenger and is thus excellent for all skin types, particularly dry and mature skin.Mafura Butter has been shown to have antimicrobial and anti-inflammatory activity, due to the presence of limonoids such as Trichilin A. This can help soothe irritated skin conditions, aid wound healing and help alleviate aches and pains.